Picky Eaters New Year Special! January can be a challenging time of year. The excitement of Christmas seems long gone but the prospect of holidays and nice weather is still far away. Perhaps the holidays brought with it a few too many ‘celebrations’ and now it feels like an up-hill struggle to get back to healthy eating? 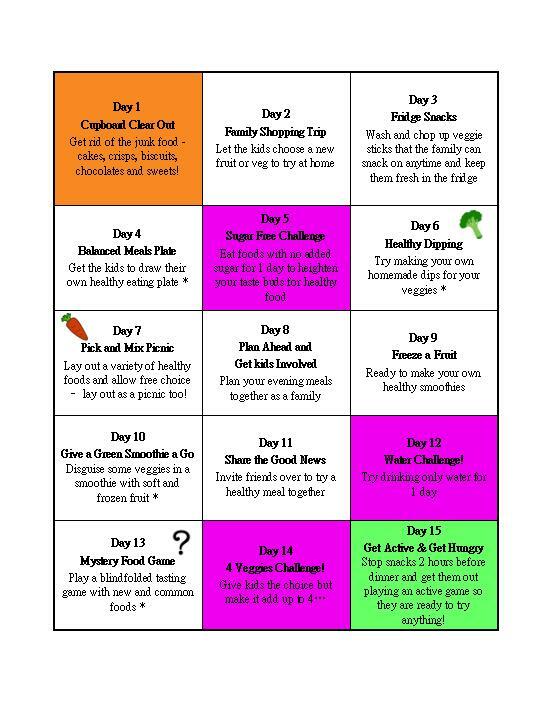 So to help, I’ve put together a 15-day Picky Eater Challenge to help get you and your family back on track! Follow the daily tasks and challenges that are designed to help encourage the more fussy and faddy ones in the family to eat healthily too. * For more details on these specific challenges see facebook posts on days 4, 6, 10 and 13! If you don’t have unhealthy food in the house, you can’t eat it! Encourage a bit of exercise before meals to help build up an appetite.